As an organization, we must comply with all of the rules and regulations imposed upon us by regulatory authorities. Our Convention on International Trade in Endangered Species (CITES) import/export permits serve as an example of an important area of compliance for ZSSD. Recently, the Legal department was tasked by the United States Fish and Wildlife Service (USFWS) to create a training course on CITES permits, which pertain to wildlife/biomaterial transactions. In designing the course, scheduling presented a major issue. We needed to maximize attendance as well as ensure that all necessary employees were trained within a tight timeframe. SDZ Global Academy provided the solution. We used the Academy's DIY course creator to create a course that was easily accessible and met the USFWS requirements. The DIY Course Creator menu option can be added to an institution's custom Academy sites. The course offered flexibility in that the employees were able to take it when their schedule allowed. As a result, we had 100% attendance and we remain in compliance with all of the CITES requirements. I applaud the SDZ Global Academy for providing a vehicle that makes training easy and accessible. I look forward to collaborating with the SDZ Global Academy on more projects in the future! In recent months, the Academy has added a number of new Introduction to Animal Species courses! These modules are a great resource for interpreters, but they offer insights for veteran animal keepers too, providing a glimpse of natural history that helps address husbandry concerns. The modules address common questions and provide an up-close exploration of what the various animal species are all about. These modules can easily be integrated into your current training program. Providing online modules that team members can complete anywhere and at any time overcomes one of the major challenges of training: getting all participants together in one place at one time. At the San Diego Zoo and Safari Park, participants complete online modules on their own before attending group training programs. They are able to master key vocabulary and concepts, giving them a solid foundation that allows them—and their trainers—to make the most of in-class and on-site training. Look for modules about cats, elephants, birds, and mammals—coming soon! "New features and updates for 2015"
Our goal is to have a monthly communication meeting in which we provide all administrators with updates and training on our learning management system processes, features, and tools. We also look forward to hearing from you on topics that you feel would be useful and educational as we create agendas for future meetings. Please join us for our January meeting! Would You Like Your Colleagues to Receive the Academy Newsletter? The opportunity to collaborate on the topic of training and share industry news seems to be resonating with zoo professionals far and wide. The Zoo & Conservation News section at the bottom of this newsletter is also a resource to share industry news with each other. If you have colleagues who you think might like to receive this newsletter, have them send us their first name, last name, institution, and email address. The Chattanooga Zoo in Tennessee has joined the Academy's collaborative learning environment with their own privately branded custom sites, one for their employees and one for their volunteers. Welcome! Roar Louder is San Diego Zoo Global's monthly training and communications meeting for managers, which is coordinated by Human Resources. San Diego Zoo Global managers are required to attend six of these meetings each year. 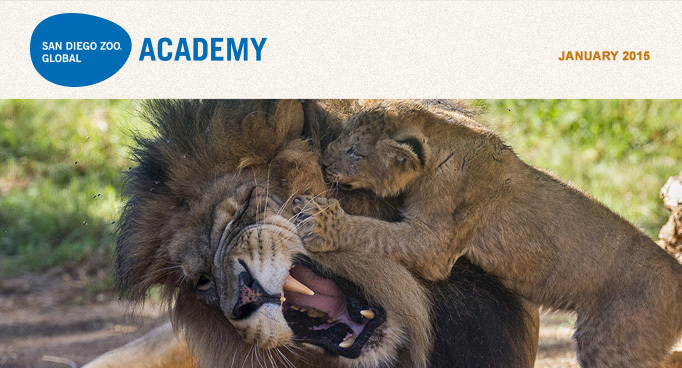 Now that online training through the Academy has been integrated into San Diego Zoo Global operations, one of these required Roar Louder meetings can now be taken online. This is a way to introduce the Academy's online training to all our managers. It also can be a time saver and an effective and efficient way to disseminate important information for the organization. Do you have some volunteers who are technologically challenged, while others take to your Volunteer Connection site like a fish to water? Leverage your training by utilizing your tech-savvy volunteers to train your tech-challenged volunteers. Create a checklist of items you want your volunteers to be comfortable with on your volunteer site. Walk through this list with the potential volunteer trainers, showing them how you would like your tutorial taught. The best way to learn is by doing, so, if you have a learning lab, schedule an hour or two and have your volunteer trainers train their fellow volunteers, each at their own computer. If you don't have a learning lab with multiple computers, have them bring in their own laptops or tablets if you have WiFi capabilities, or schedule one-on-ones. One trainer could train 4 to 8 people in one day using this method! Don't bog yourself down—have your veteran volunteers help you! You are sure to find several who are glad to help. At San Diego Zoo Global, we have an internal employee newsletter called ZooView. Here is an excerpt from an article I wrote this month preparing staff for the online safety training being rolled out in 2015. "The Safety Team began to utilize the My Academy resources this year to provide employees with safety training. For as long as I can remember, the common complaint about safety videos has been that they are not relevant to our industry. That is about to change. With tools available in My Academy (San Diego Zoo Global's employee site), we are able to develop our own courses using the Do-It-Yourself (DIY) course creator. Over the last six months, we developed and rolled out courses for Heat Illness Awareness and FWS CITIES Compliance. Both of these are required by a regulatory agency. By including these courses in the learning management system of My Academy, we now have compliance records of everyone who completed the courses, time spent, and quiz scores. I will be looking back at our injury and illness statistics to develop a plan of action for various departments to reduce injuries next year."